Though I recognize I’m a bit skeptical of much of the miracles promised by various skincare products, I’m even more skeptical of cleansers and removers that make promises, too. Products like cleansers and removers are not on skin very long, so it’s hard to believe they would be able to provide any long-term benefits. 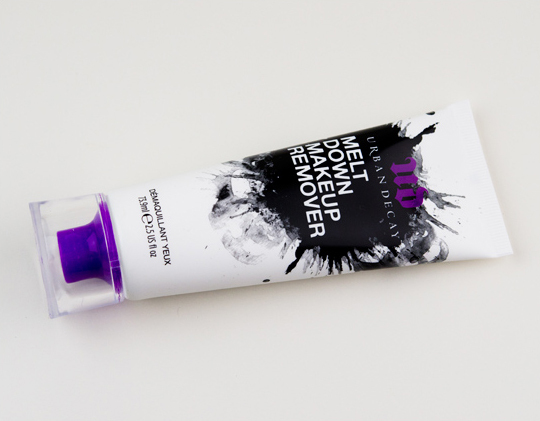 Urban Decay’s remover includes several ingredients, and one is noted to “revitalize collagen production” while others (various oils) will moisturize and replenish. When it comes to directions, I’m glad I waited for this product to go online, because the back of the tube left me clueless–did I use water, did I use it everywhere, how much, when, what! Again, the best way to use this, based on my testing, has been on a cotton round or toner sheet, pressed against the eye for 10-15 seconds, and then wipe away the makeup. It does a good job of removing the bulk of my makeup, but I do feel like it leaves my eyes a little cloudy. There is no greasy residue or feel afterwards, but the cloudiness necessitates rinsing with water, so then there is definitely no product leftover to sink into my skin and revitalize or moisturize anything. I needed about a pea-sized dollop for each eye. It will remove face makeup, too, but you’ll end up going through this little tube rather quickly if you do so! If it’s for eyes, it’ll last you a lot longer, and therefore the $24 price tag stretches out over a much longer time period. It does remove long-wearing products without much fuss, feels nice against the skin, and doesn’t leave behind any greasy residue–but it did make my eyes a bit cloudy and may require a second cotton round to remove a few streaks of makeup left behind (which just feels wasteful, so I rinsed off). Good, not great. I’ve got several eye makeup removers and whole face makeup removers that I’m happy with so I’ll pass on this one based on your review. But, Christine – what is a “toner sheet”? I don’t know if I’ve ever seen such a thing before. I looked at that website and wow their prices for toner cloth is SO expensive! I use Japanese ones that you can get at any Asian supermarket or drugstore (or eBay, like these: http://cgi.ebay.ca/200-Pcs-White-Makeup-Remover-Facial-Cotton-Pad-lady-/140532610000?pt=LH_DefaultDomain_0&hash=item20b86573d0#ht_3488wt_912), and are about $2-5 for the same quantity and quality (lint free, gentle on skin, etc.). I stopped using cotton rounds years ago because they sucked up all the product instead of putting product on my skin. I highly recommend toning cloth! just wanted to say I noticed on the tube it says Demaquuillant Yeux…but God knows why only in French! So it’s for eyes…but why on earth write it just there?? No idea. It’s not in the descriptions online, and it’s surely not on the tube! Even though it is a US Product, France is the Cosmetic Capital of the World as Milan is to the Fashion Industry. Christine, What’s a toner sheet? It says “demaquillant yeux”, so it’s for the eyes! Well, I guess I’ll skip this eye makeup remover. 😀 Thanks Christine for saving me some cash! Oh, and on an slightly-unrelated note… what are toner sheets? 183974281374x better than cotton rounds. I believe it IS an eye makeup remover because the “démaquillant yeux” near the bottom of the tube is French for eye makeup remover. Usually it would say pour to indicate it’s for eyes – I did a google translation last night, and when you just translate those two words together, it comes out as “makeup remover.” But really, I should be fluent in French to find that out? This is a U.S. company and nothing in the description says this is for eyes only? I googled it with the accent on the E, and it did translate to eye makeup remover, which just makes me wonder why they couldn’t be bothered to write that in English anywhere, given their customer base. Yeux means eyes in french. Demaquillant means makeup remover. You don’t necessarily need the pour- regardless of what google translate might tell you. Please don’t assume google translate is the authority on the French language. I certainly don’t – but I wanted to do my best to provide a translation and give a source for it. I wrote this post at 2AM, so I wasn’t going to pay $20 to hire a translator for those two words. I’m definitely not so ignorant that I would assume Google Translate is an authority on ANY language. I’m pretty sure I didn’t say that and only explained what I used to translate. “Usually it would say pour to indicate it’s for eyes” – that’s weird Christine… I agree with Alexandre, you don’t need “pour”. I’m with Christine on this one. No one should have to Google nor translate ANY U.S. product that goes onto the skin and especially not the eyes. The packaging should state what the product is and how to use it – – – in English. Thanks Christine for that review! I ALMOST was going to try it…always looking for something to buy..haha…I’ll stick with Clinique eye makeup remover! Its less expensive and I have a FABULOUS cosmetic rep that takes GREAT CARE OF ME at Nordstroms…like I say…I’m willing to pay more if I get great customer service and Nordies has the BEST customer service! Soo…I’ll stick to Clinique until the “next best thing”…Thanks again Christine and have a great and safe holiday..well what’s left of it! I like better customer service or people who really know their stuff, too! All this makes me think of is the beautiful Mermaid UD eye makeup remover I picked up at the Disneyland Sephora. When I used it, I wept great tears of pain for the burning in my eyes. So this product is an unmitigated PASS for me, plus unclear instructions is such a face palm. What is your holy grail eye makeup remover? I managed to get my hands on this and a few of the other new products and reviewed them too. I found the smell to be quite medicinal, but it works tons better than the last “Clean & Sober” makeup remover by UD don’t you think?? I didn’t notice any smell to mine – I never used Clean & Sober, sorry! Most of Urban Decay’s products are amazing, but I’m surprised by this. My absolute favorite makeup remover is Clinique’s Take the Day Off. Demaquillant means make-up remover anyway, with or without the é. It’s the “yeux” that makes it an eye make-up remover because yeux means eyes. I’m just going by what I put into Google translate to get it translated 🙂 Google apparently feels differently (though I know it shouldn’t modify the meaning). Best I could do at 2AM in the morning 🙂 Couldn’t exactly hire a translator! I took French in high school, but it’s completely useless to learn (I very much regret not choosing Spanish) where I live, so I don’t remember much from it – and I didn’t want to rely on the little I learned (and the even less I remember). And you’re absolutely right to be suspicious of anti-aging claims for products like this. 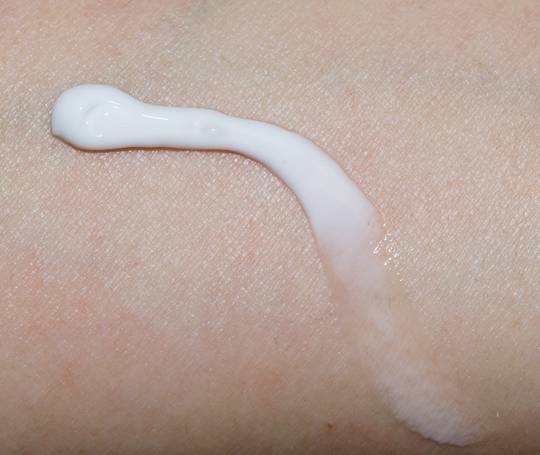 In order to stimulate collagen production a cream has to penetrate the upper layers of the skin and it has has to stay there, neither of which would be the case with a makeup remover. The idea of a makeup remover that is quickly and easily absorbed deep into skin is kind of gross when you think about it. Since we have Urban Decay in Quebec (we couldn’t because it was not translate in french), it’s seems that they write in french on everything! I find it very lol! But, I don’t think it’s only for the eyes. Yes, it’s written that but we have a lot of bad translation here so we often refer to the english description. Being from Ottawa, Canada I can read French so I can see it is eye makeup remover. Very strange that UD wouldn’t put it in English. I don’t think that they usually use French on their packaging? Perhaps they are trying to be “fancy” like YSL & Lancome, but it isn’t working. I believe they have a little on all their packaging, though I remember reading complaints about the accuracy of it (or maybe it was poorly phrased)! Unbeknownst to a lot of people, in order to sell certain products in Canada there has to be bilingual packaging on the product. I figured that was why the French was on there (I have no problem with French being on the packaging – I just have a problem with the lack of information in English!). I don’t have a problem reading French, given here in Ontario it is taught in school. But I wouldn’t expect Urban Decay’s primary American buyers (young American girls) to know that les yeux means eyes. It’s surprising that Urban Decay chose not to be very clear with their product description. I’m thinking about trying this, but I’m still on the fence. Thanks, as always, for your review! You don’t need Google Translate to work out what demaquillant yeux means.. whether you’ve studied French or not, It’s easy enough. Really? I’m not one to be particularly agreeable but come on- there’s no argument to make- Christine is right. The Etats-Unis ( sorry no accents) official language is English, hence this is a no brainer. I read French passably, but that’s not the point. We are consumers and should expect to have clear, concise instructions for the product that is going on our face and , conceivably, eyes as well. This! I was really annoyed at the lack of clear, concise labeling and instructions, which is why it went to the point of having to read every single word, whether English or not, on the tube. Thank you, Emily! You know I’ve got your back! Like I said, the disagreements are non-starters. I was irate enough to type this while in line at Petco! I absolutely love this remover. I have very specific sensitivities so finding an eye makeup remover that doesn’t irritate my eyes or give me a film that lasts for 15-20 mins has been impossible, but this one is perfect. It takes off all of my long-wearing and waterproof eye makeup products and leaves the skin around my eyes soft. Agreed.. it removes 24/7 liners no problem, but it’s still really gentle. I love it! Yuck! Sounds horrible. I have to be really careful what I put on my eyes for removal. Oils in this would be a huge NO for me. Sounds like a mess UD has with their tech writing on this product! I was not impressed by this product. I just tested it out in Ulta trying to remove the Urban Decay Shadow sticks I swatched, and it took me four applications of this product to remove the swatches. Has anyone purchased this and compared it to the MUFE Sens/Eyes? Now that product I LOVE…..